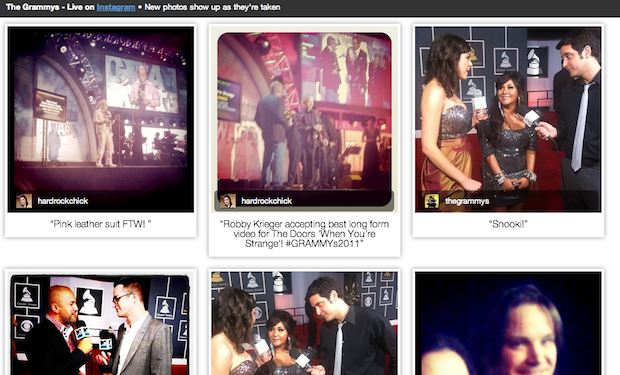 Instagram Finally Gets A Better Website — For The Grammys. A Sign Of What's To Come? When it comes to Instagram, there are generally two complaints: 1) there’s no Android app yet. 2) the web experience is severely lacking. Today they’ve finally taken a stab at the latter. Well, sort of. The Instagram team has put together a what they’re calling a “microsite” as a subdomain of their main website. Why? Because some of the team is at the Grammys right now and they’re working alongside MTV to cover the event in the filtered, square images that are Instagram’s hallmark at the moment. It’s a nice partnership for Instagram to grab to help increase their exposure. But the bigger deal may be what’s going on behind this microsite. As you can see, images are coming in in realtime and the page automatically updates with the newest ones. I wouldn’t be surprised if this was a rudimentary look at part of what they’re thinking about for their main site as well. Currently, the Instagram website is just a static landing page pointing you to their iPhone app. Meanwhile, each image has its own landing page as well, but you can’t do anything on the page besides see the picture and see who took it. You can’t even click on people’s profiles. But co-founder Kevin Systrom has made it clear that they’re working on their web presence but want it to be really good and different — more than just a static stream of photos that replicate the app photo stream experience. Or perhaps they’ll make these types of live-updating sites for each hashtag used on the service. That could be perfect for events such as this.